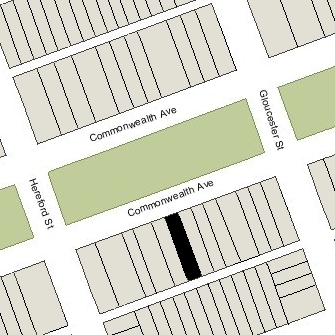 300 Commonwealth is located on the south side of Commonwealth, between Gloucester and Hereford, with 298 Commonwealth to the east and 302 Commonwealth to the west. 300 Commonwealth was designed by architect Obed F. Smith and built in 1880-1881 for Uriah H. Coffin, a building contractor, for speculative sale, one of two contiguous houses (300-302 Commonwealth). Uriah Coffin is shown as the owner on the original building permit applications, dated September 13, 1880 (for 300 Commonwealth) and November 11, 1881 (for 302 Commonwealth, with a notation that the “plans are duplicate” of 300 Commonwealth). Uriah Coffin purchased the land for 300-302 Commonwealth on September 15, 1880, from William D. Pickman and Jacob C. Rogers. It was part of a tract of land originally purchased by Nathan Matthews on January 2, 1871, from David Sears, Jr., Frederick R. Sears, and Knyvet Sears. Click here for an index to the deeds for 300 Commonwealth. On August 12, 1884, 300 Commonwealth was purchased from Uriah Coffin by Olivia Cook (Chapman) French, the wife of crockery merchant William Abram French. They lived in Jamaica Plain and do not appear to have occupied the house. On January 1, 1886, 300 Commonwealth was acquired from Olivia French by Josephine P. (Appleton) Brown, the wife of stockbroker John Howard Brown. They previously had lived at 171 West Newton. J. Howard Brown died in February of 1897. Josephine Brown continued to live at 300 Commonwealth. Her widowed sister, Myra (Appleton) Porter, the widow of William Porter, lived with her at the time of the 1900 US Census. 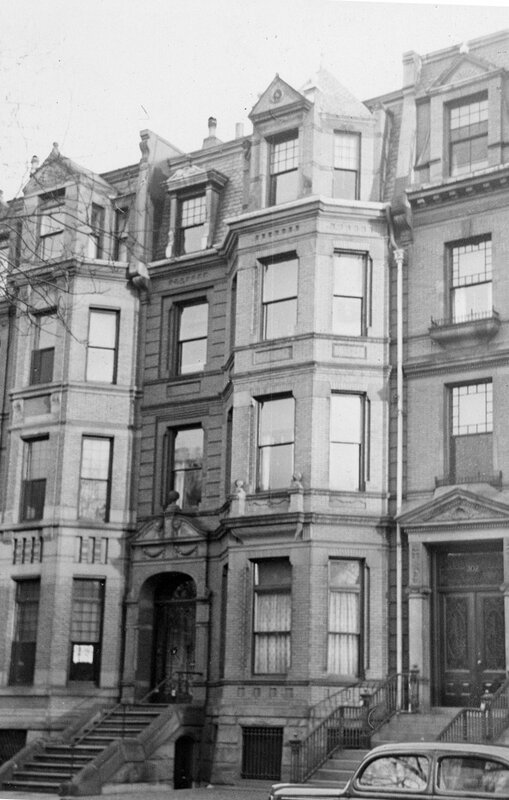 Josephine Brown continued to live at 300 Commonwealth during the 1909-1910 winter season, but moved thereafter to 636 Beacon. On November 1, 1910, 300 Commonwealth was purchased from Josephine Brown by Grace Evelyn (Knight) Whitten, the wife of Charles Orville Whitten. They previously had lived in an apartment at 295 Commonwealth. They also maintained a home in North Sudbury. Charles Whitten was a gelatin and glue manufacturer. They continued to live at 300 Commonwealth during the 1922-1923 winter season, but by 1924 had made Marblehead and Palm Beach, Florida, their homes. On June 12, 1923, 300 Commonwealth was purchased from Evelyn Whitten by Mary Fairfield (Robinson) Linnell, the wife of John Wesley Linnell. They previously had lived in Brookline, and before that at 15 Bay State Road. A former stockbroker, John Linnell was president of the Massachusetts Consolidated Mining Company. John Linnell died in December of 1943, and Mary Linnell continued to live at 300 Commonwealth until her death in 1949. On October 10, 1949, 300 Commonwealth was purchased from Mary Linnell’s estate by Dr. George J. Colantino, a physician, and his wife, Edith E. (Fitzgerald) Colantino. In November of 1949, he filed for (and subsequently received) permission to convert the property from a single-family dwelling into a three-family dwelling. 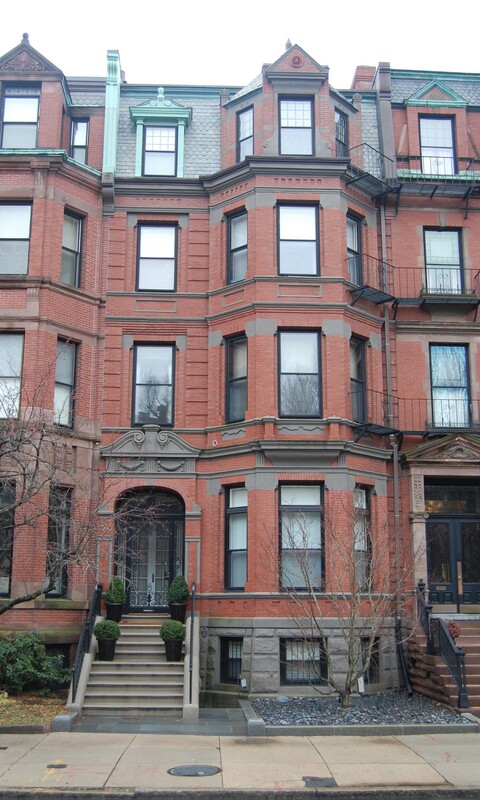 The Colantinos lived in one of the apartments at 300 Commonwealth and he also maintained his medical offices there. They previously had lived in Medford. They continued to live at 300 Commonwealth until about 1953, but had moved to 404 Beacon by 1954. By 1950, one of the other apartments was the home of Toba Esther Finn (Tresa E. (Finkelstein) Friedman), the former wife of Julian Friedman. She was credit manager of Morris Gordon & Son, hotel and restaurant equipment dealers. She previously had lived in an apartment at 256 Beacon. She continued to live at 300 Commonwealth in 1953, but in February of 1954 purchased and subsequently moved to 317 Beacon. By 1954, 300 Commonwealth was the home and medical office of Dr. Juanita P. Johns, a physician. She probably lived in the apartment previously occupied by the Colantinos. In 1953, she had lived and maintained her offices at 313 Commonwealth. She continued to live and maintain her medical office at 300 Commonwealth in 1955, but moved thereafter to an apartment at 3 Arlington. On March 2, 1956, 300 Commonwealth was purchased from the Colantinos by Bessie E. (Moro/Murachowski) Sisson, the widow of Harold Howard Sisson (Sisonsky). She previously had lived at 352 Commonwealth. On April 23, 1956, she transferred the property to Alice M. Keating, a secretary with the law firm of Jean (Jacob) Sisson (Sisonsky), Harold Sisson’s brother. Alice Keating presumably held the property on Bessie Sisson’s behalf. Bessie Sisson continued to live at 300 Commonwealth in 1959, but moved thereafter. On August 31, 1959, 300 Commonwealth was purchased from Alice Keating by Benjamin Harrison Brightman and his wife, Doris (Cooperman) Lubarsky Brightman. He was a sales manager. They previously had lived in an apartment at 208 Commonwealth. They continued to live at 300 Commonwealth until about 1973. On April 27, 1973, 300 Commonwealth was purchased from the Brightmans by Edward Jackson Hall and his wife Virginia (Coleman) Hall. They previously had lived in an apartment at 33 Commercial Wharf. On August 14, 1986, Edward Hall transferred his interest in the property to his wife. On June 30, 1995, 300 Commonwealth was purchased from Virginia Coleman (formerly Virginia Coleman Hall) by Thomas W. Blumenthal and his wife, Lisa (Achki) Blumenthal. In April of 1996, he filed for (and subsequently received) permission to convert the property from a three-family dwelling into a two-family dwelling. And in September of 2001, he filed for (and subsequently received) permission to convert the property into a single-family dwelling. 300 Commonwealth a single-family dwelling in 2017.